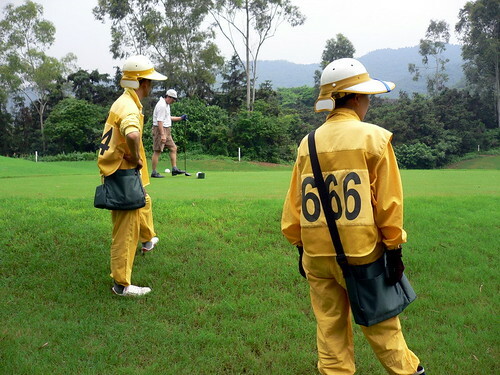 Caddies are compulsory in Spitland golf courses as opposed to Singapore, Malaysia and USA where caddies are optional. To most guests, caddies are assigned to them at random. As for the regular members like us, we have our regular caddies to serve us, if we like, for an additional nominal fee. The advantage of a regular caddie is that he/she would know your game pretty well after several rounds together. It makes clubs selection, lie reading, green reading, etc so much easier and more convenient. Besides, a random caddie can be a hit-or-miss affair. There are times you get a very competent one while other times you get duds that would make you blow a few blood vessels along the way. Engaging a regular caddie eliminates this risk as they have already been qualified by you. My caddie has been with me coming to 3 years already. She was new when she started and I taught her everything I know. I tend to go for "fresh" caddies as it is easier to train them given that they don't have to unlearn all the bad habits that they pick up along the way. My dad is the complete opposite. He prefers the super old birds who knows the golf course inside and out. Where each blade of grass is and what direction they are growing. That way, he can leave all the thinking to the caddie who would simply tell him where to play the next shot, what direction is the wind, what hazards to look out for and with which club. Anyway long story short. Dad's caddie retired and he had to find a replacement. Since we are aware of my dad's "Lao Jiao" requirement, my caddie recommended her friend of 6 years experience. When she showed up, I let out a snigger much to the bafflement of everybody. Aloe: If he wants, it's ok. I have 4 backup caddies. Otherwise, I can always find another newbie and train all over again.